Last Update: 2017-10-17 - Major Update: This release includes minor fixes and enhancements. Missing a dental appointment is an unpleasant thing, missing a scheduled call to your client overseas puts you into an even more uneasy situation, but missing your best friend's birthday is embarrassing beyond any comparison. If you feel that sometimes you can't keep up with the pace of your life and can't keep track of dozens of important events, specialized software with an advanced notification system will be the remedy that you so desperately need. And if you don't know where to start, take a look at ABC Birthday Reminder - and it may well become your favorite for good! The name of ABC Birthday Reminder speaks for itself - it's a comprehensive toolkit that keeps detailed information about birthdays and other remarkable events. You can enter recurring events, gift descriptions, gift cost calculations, notifications and store all this information in a searchable database. Not only does the program contain your own information, but also features a holiday database supporting the Microsoft Outlook HOL format. ABC Birthday Reminder starts silently when the OS loads and stays in the system tray, so you can easily access it at any time with a single click. 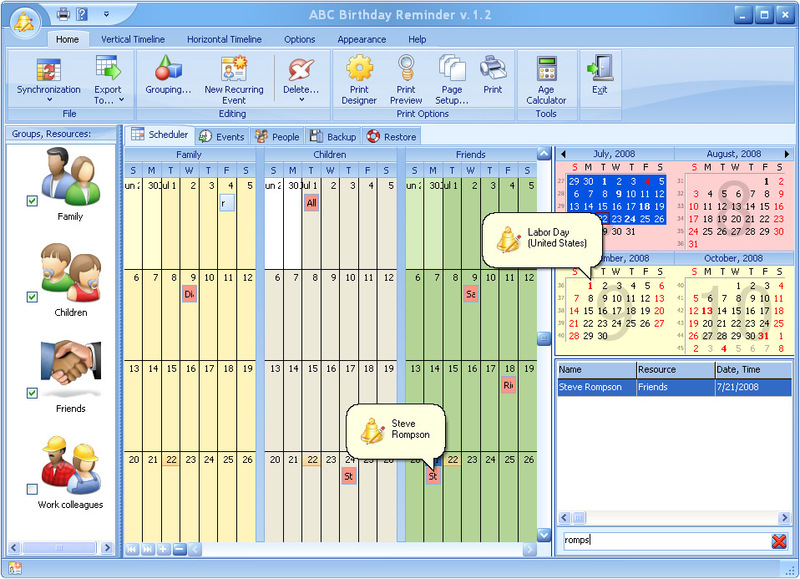 The software offers a variety of calendar views and comes preloaded with dozens of skins and color schemes. Which is more, you can synchronize events with Microsoft Outlook and even export them to popular formats - iCal, XLS, HTML, PDF, XML or TXT! If you want to know how old your best friend will be on a specific date 15 years from now - no problem, ABC Birthday Reminder will do that as well! Remembering your friend's birthdays won't be necessary anymore - even if you don't use your computer every day, you can easily print out the list of upcoming birthdays for a month or year and keep it on paper nearby. If you want to avoid embarrassing situations and having to call your friends in an apologetic tone, check out ABC Birthday Reminder! It has perfect memory and will never let you miss an important date in your life!